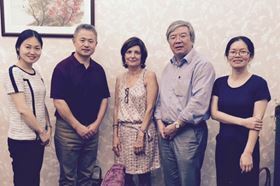 Left to right: Lisa Zhang, Elsevier; Prof. Hau-Xin Peng, Zhejiang University; Dr Christiane Barranguet, Elsevier; Dean Gaorong Han, Zhejiang University; Prof. Xuxia Yao, Zhejiang University. This September, Dr Christiane Barranguet visited BeiHang University, Beijing Institute of Nanoenergy and Nanosystems, Fudan University, and Zhejiang University in China, to explore how Elsevier and Materials Today may better support local researchers. Dr Barranguet spoke to researchers at all levels, spanning materials science, to find out about the challenges faced by the community in China. Together, topics including open access, funding, local and international conference support, peer review, as well as new journal launches were discussed; with plans already shaping up for 2017 and beyond. "Chinese universities are among the most productive worldwide, and their impact follows the same trend, leading the way in many emerging fields of materials science," says Dr Barranguet, "Materials Today is committed to supporting Chinese researchers and institutes, both through our extensive journal portfolio and surrounding initiatives".